KeepTabs is the CRM for your network. Never lose track of anyone, ever again. Keep track of the people most important to you. It's exhausting to keep track of everyone in your network, let alone keep in contact with them. KeepTabs has notes and reminders, which allow you to pick up every conversation exactly where the last one ended. Make your network feel appreciated. Be the hero your network needs. Never forget a birthday, anniversary, or to follow up with your college roommate a month after his childhood dog dies. Designed with people in mind. 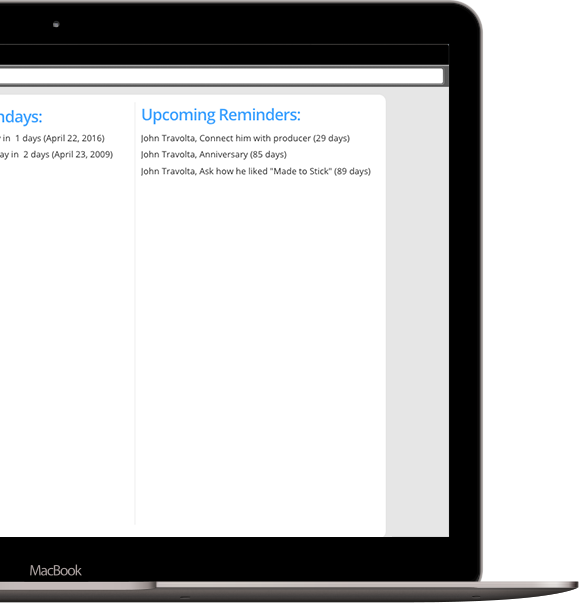 With KeepTabs you can toss all your spreadsheets, post-its, and hastily written notes. KeepTabs has been designed from the ground up to be as user friendly as possible. If you're in the "relationship" business, you need KeepTabs. The investor who said to call him when you had revenue. The prospect who was not quite ready to purchase your services. The uncle you keep forgetting to call. The industry journalist who you want to pitch next quarter. Your grade school friend who moved across the country. That guy you met at that conference who was making that app. We meet tens of thousands of people in our lifetime. • How many connections do you have on Linkedin that you haven't spoken to in years? • What about your college friends or old colleagues? It's exhausting enough just to keep track of everyone, let alone keep in contact with them. • See information and important reminders on your network at a glance. • Find out who you need to reach out to, and see who you’re waiting to hear back from. • Easily update your information and your contact’s information. KeepTabs's contact list is dynamic. As you contact people, they turn green and fall to the bottom of the list. As time passes, they transition to red and rise to the top of the list. Stop switching between software, phonebooks, and notepads. See all of your important birthdays and reminders at a quick glance. Met cool people at a conference last year? Have a weekly basketball game? Keep them organized with easy to manage groups. No software to install. Access your contacts from anywhere in the world, on any device. Don't leave anyone out. See when you last contacted someone. Does someone need a follow up? Quickly see who has yet to reply back to you. Designed to be as intuitive as possible. A quick glance is all you need to see all of your upcoming reminders for all of your contacts. See what your contacts are up to by adding links to their Facebook, Reddit, HackerNews, etc. Want to try KeepTabs? The free version lets you add up to 5 contacts, with no credit card required! Nice shades! The Professional plan lets you add unlimited contacts. Take control of your network! 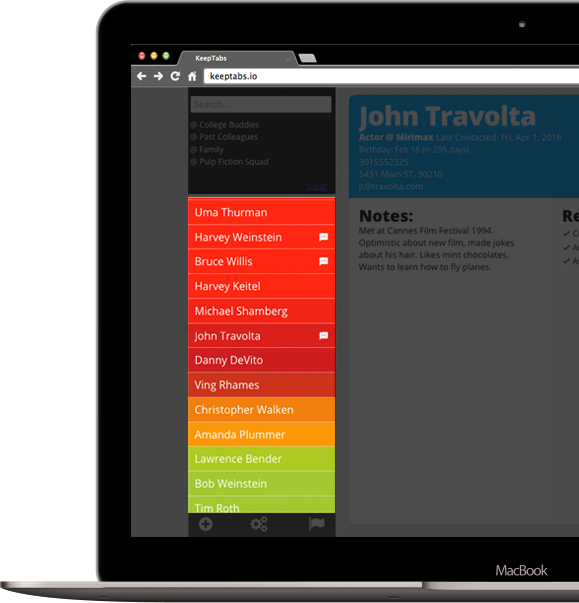 Get started with KeepTabs by adding up to 20 contacts. Nice shades! This plan lets you add up to a total of 50 contacts. You are The One. The unsung hero of friend groups. The only one in your family who calls your continent-hopping cousin. Add unlimited contacts. Take the guesswork out of your network. We'd love to hear from you. Do you have a question about KeepTabs? A feature request? Curious to know how to make incredible cold brew? (Hint: try adding some mint leaves). Shoot us an email and we'll get back to you as soon as possible. KeepTabs is designed to be as user friendly as possible. We extend this "use friendly first" thought process to our pricing scheme. There are just 2 simple options, free and Professional. 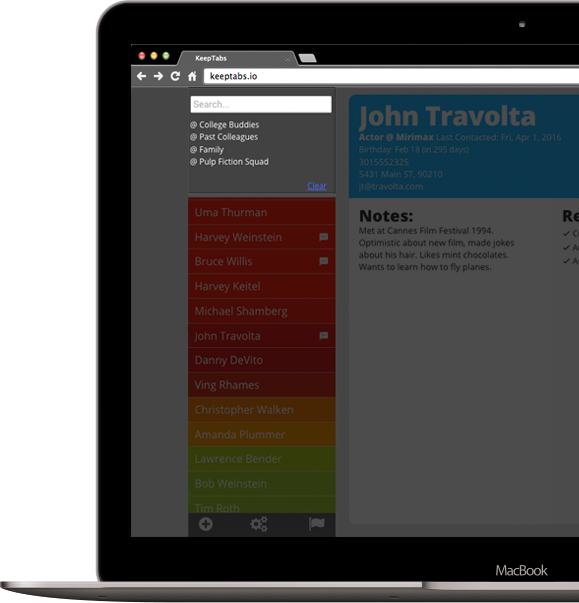 Want to try out KeepTabs? The free plan is free forever, no credit card required. Need more contacts? 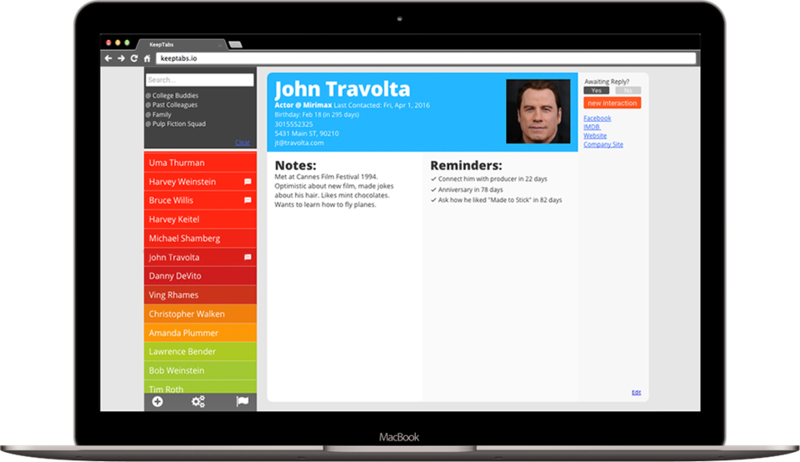 The Professional version of KeepTabs give you unlimited contacts, for a low monthly price.